Want to lose weight on a budget? Diets can end up being pretty expensive if you’re not careful. But you shouldn’t have to overspend when you’re trying to lose weight. There are plenty of ways to get to your ideal weight and save money at the same time; you just have to know the hacks! If you’re on the keto diet, check out how to do keto on a budget! The keto diet is low in carbs, high in (good) fat, and moderate in protein. There aren’t many diets that tell you to stock up on bacon and heavy whipping cream, but the keto diet isn’t like most diets. Naturally, your body burns carbs for energy, but when you eliminate carbs from your diet, it has to look for another source of energy. Instead, it starts burning fat! And not only the fat you eat, but the fat that’s stored in your body, too! How Fast Will I Lose Weight on the Keto Diet? Since everyone’s body is different, there’s no exact answer to this question, however there is an average weight loss rate you can expect on the keto diet. In the first week when you’re getting into ketosis, you’ll lose 2-10 pounds. This is due to fast water weight loss due to your lower carb intake. Drink more water in this phase to curb constipation and dehydration. After a week or two, you can expect to lose weight at a slower, more steady pace. Average weight loss is usually around 1-2 pounds per week. You’ll see the biggest progress when you stick with it for a few months. Be consistent and don’t give up! Keep it simple when you’re keto shopping. Less ingredients means less money and you can still make delicious meals! A cheesy omelette is only a couple of ingredients and will satisfy you all morning. Buying and eating in season is one of the best keto budget hacks. The rest of the year, buy frozen veggies to save money. Before you make a trip to the grocery store, make sure you check the deals and coupons available. If there’s a deal on a food item you use a lot, stock up on it now for later! Batch cooking is one of the best ways to ensure you always have keto-meals in the house and will also help you save money. Choose one day a week to do your cooking and portion meals into meal prep containers so they’re easy to grab! Going to the grocery store without a shopping list is never a good idea! It’s so easy to spend more than you want when you don’t have a list to guide you. If you want to stay on budget, create a shopping list and don’t stray from it! When you’re starting a new diet, meal planning is key. When you’re prepared, it’s so much easier to stay on track and reach your weight loss goals. Meal planning ensures you don’t mindlessly nibble on unhealthy foods or grab take-out for dinner when you’re in a rush. Here are 5 steps to meal planning on the keto diet. 6. If you find it challenging to figure out what to eat (and when to eat it) while on the keto diet, Tasteaholics offers weekly meal plans delivered straight to your inbox. Sign-up for your free 7-day trial HERE. Speaking of grocery lists, here’s a few tips to create a killer keto shopping list! When it comes to meat and fish on the keto diet, shop for grass-fed and grass-finished beef, pasture raised chicken and pork, and wild caught seafood. The goal is to consume higher quality fatty meat, so keep that in mind! On the keto diet, focus on increasing your consumption of omega 3 fatty acids that have anti-inflammatory properties, as well as saturated fats, monounsaturated fats, and polyunsaturated fats. Some of the best keto fats are foods like fatty fish, walnuts, macadamia nuts, olive oil, avocados, red meat, duck fat, sardines, and chia seeds! Instead of sugar, use keto-approved sweeteners like stevia, allulose, truvia and swerve. Most non-starchy vegetables are fine for the keto diet. Some of the best low carb vegetables are broccoli, carrots, cauliflower, onions, mushrooms, cabbage, green beans and spinach! Some fruits are super high in carbs, but there are a few low carb fruits you should focus on. Put fruits like coconut, tomatoes, berries (blueberries, strawberries raspberries, and blackberries), and grapefruit on your grocery list! When shopping for dairy products, opt for grass-fed, grass-finished dairy when possible. On the keto diet you can eat everything from cheese, sour cream, eggs and butter to heavy whipped cream, plain Greek yogurt and cottage cheese. 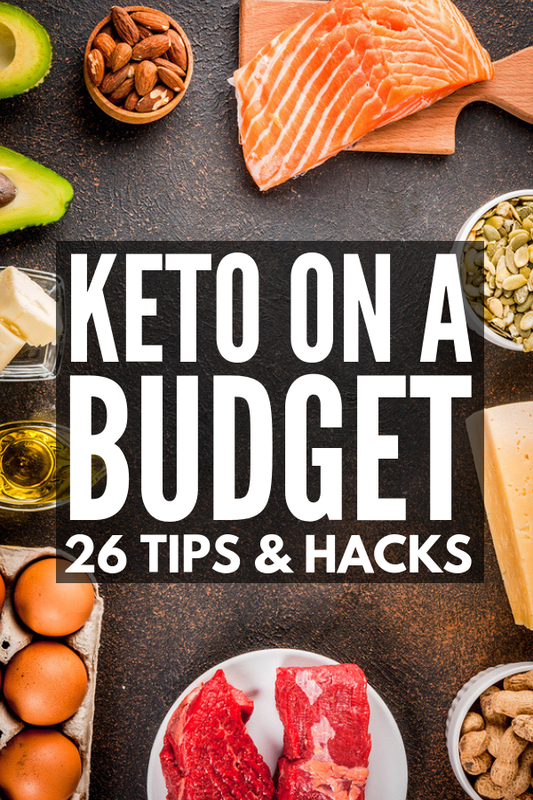 Another great tips for mastering keto on a budget is to keep keto-approved snacks in your kitchen pantry, purse, and at school or work so you don’t break your diet when hungry strikes. Here are 10 ideas we love! 1. The Easy 5-Ingredient Ketogenic Diet Cookbook by Jen Fisch: This cookbook is filled with quick and easy keto recipes that fit with busy lifestyles. Plus, there are only 5 ingredients at most in each recipe, so you can keep it budget-friendly! 2. Meal Prep Containers: Make meal prepping even easier with meal prep containers. Split your meals into different days so they’re easy to grab on-the-go! 3. Veggiespize Spiralizer: If you’re worried about getting bored with keto meals, this spiralizer will help you keep meals creative! Use it to make veggie noodles, veggie ribbons, veggie lasagna and more! 4. The One Pot Ketogenic Diet Cookbook by Liz Williams: Another handy cookbook is this one-pot keto cookbook. It offers easy keto meals to whip up on busy nights! 5. Muffin Tins: Some of the easiest keto snacks to make are keto muffins, so get yourself a muffin tin to bake muffins ahead of time and take throughout the week! The keto diet doesn’t have to cost you an arm and a leg. Use these hacks and products to lose weight and save money! If you loved reading all about keto on a budget, make sure to share this post on Pinterest. And if you want more keto hacks, please follow our Health Board on Pinterest.